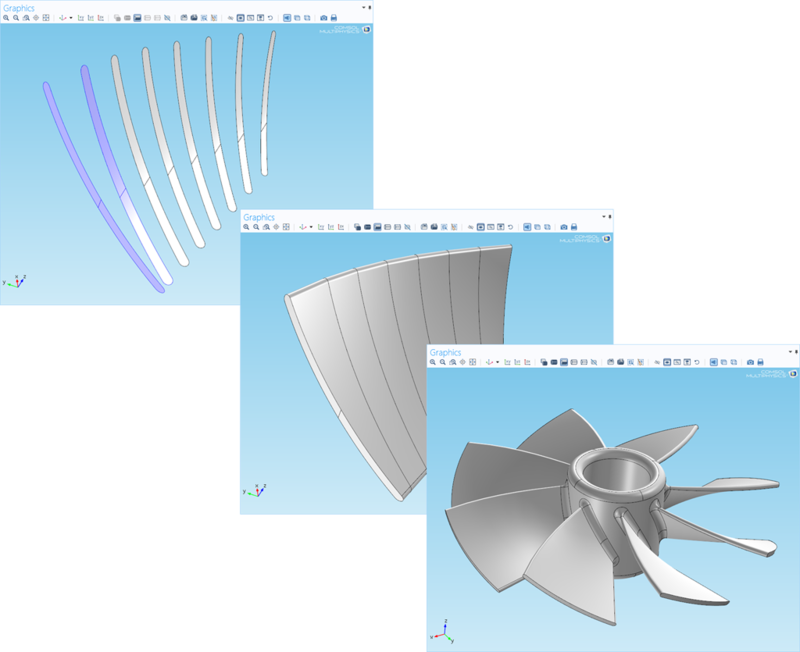 The lofting and fillet commands are used to create the different blades in this impeller. The Design Module expands the geometric modeling functionality of COMSOL Multiphysics® software by providing additional tools for creating geometries and importing a variety of CAD file formats. The preparation of a geometry is an important part of the simulation process, where the focus is on finding the most suitable way to represent the CAD design for analysis. This could involve identifying whether certain geometric details are relevant to the analysis or whether a shell approximation can be used instead for the simulation. In other situations, you may need to modify and re-parametrize certain features of an imported CAD design. Or, you may even need to construct a new and simpler parametrized geometry from the ground up, in order to capture the relevant design features for a proper analysis. The Design Module achieves this by manipulating geometries using the Parasolid® geometric kernel. Import of a number of different file formats – including the Parasolid® software, ACIS® software, STEP, and IGES formats – are supported by the Design Module. Moreover, you can import the native file formats of a number of CAD tools, such as the Autodesk® AutoCAD® software, Autodesk® Inventor® software, NX™ software, PTC® Creo® Parametric™ software, and SOLIDWORKS® software. The Design Module provides a robust tool to facilitate the integration of both simulation and CAD design within the product development process. When all changes to a geometry have been made, the Design Module can export them in the Parasolid® software or ACIS® software file formats for import into other tools. By removing a sliver, the required meshing is significantly reduced, while the defeaturing action smooths the surrounding geometry to fill the gap. 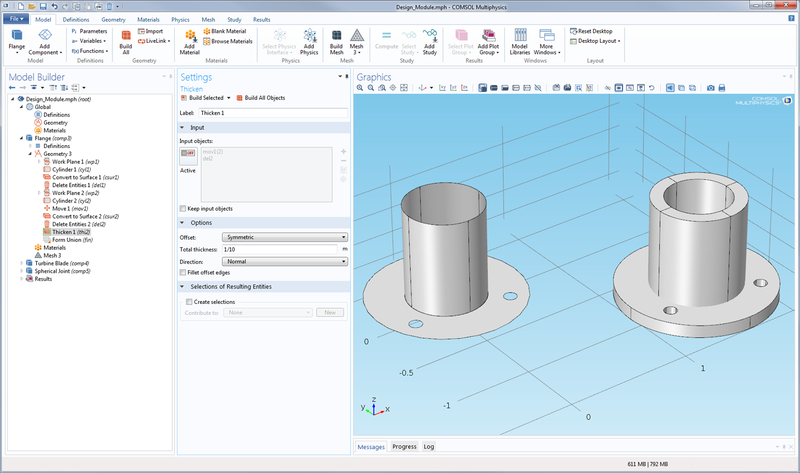 Capping or filling faces or holes can be achieved within the Design Module. Model of a spherical joint with fillets and chamfers at the intersections of the base, socket, and bearing stud. Model of a flange created using surfaces and the thicken feature available with the Design Module. The base of a helicopter swashplate requires many filleted and chamfered edges. The lofting command was used to create blades that were eventually used to make an impeller. 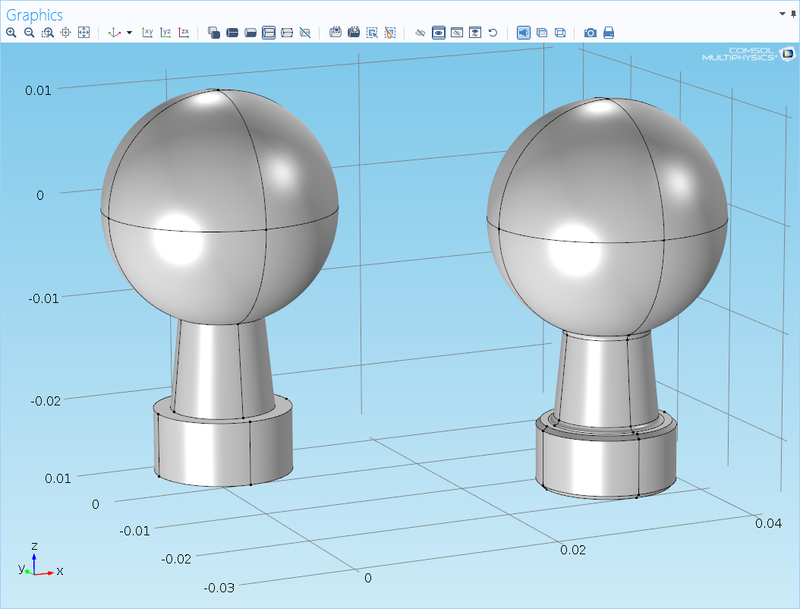 Imported CAD files are automatically converted to the format of the Parasolid® 3D geometric modeling engine within the Design Module. You can then use the Design Module to change and manipulate them. For instance, you can create a domain around a CAD design for subsequent modeling and analysis. While a CAD model can represent the geometry of an object to be manufactured, you may be more interested in simulating the environment surrounding it. Thus, you need to define an appropriate geometry to represent this environment. The Design Module is built on the proven parametric framework for generating geometries in COMSOL Multiphysics® and on the industry standard Parasolid® geometric kernel. Thereby, it enables modifying or constructing designs from the ground up and sharing them with other tools. In addition to the geometric operations found in the CAD Import Module, you can also create lofted objects based on cross-sectional profiles and use operations such as fillet, chamfer, midsurface, and thicken. For example, by using the loft tool, it is possible to create geometries from slices or contours, such as from an MRI scan. Creating fluid volumes inside imported solid objects also becomes a lot easier by using the cap faces tool. 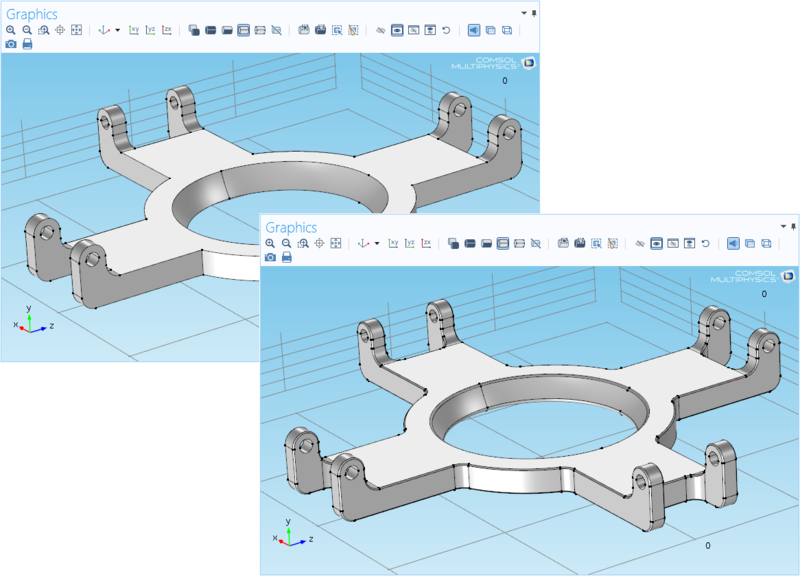 You can always perform geometry repair when importing a CAD design into the Design Module – even by default. 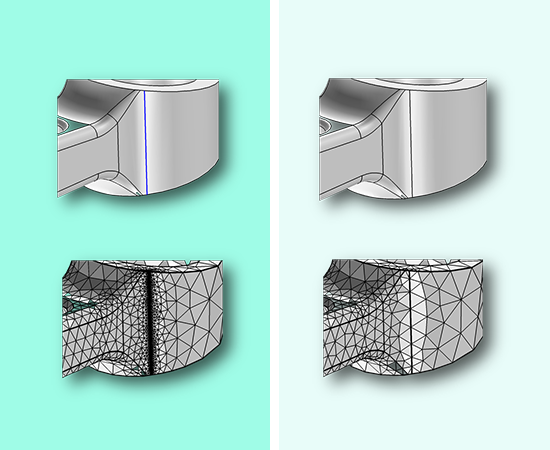 Geometry repair ensures that non-physical regions, which would prevent COMSOL Multiphysics from meshing the imported file, have not been introduced to the modeling process. 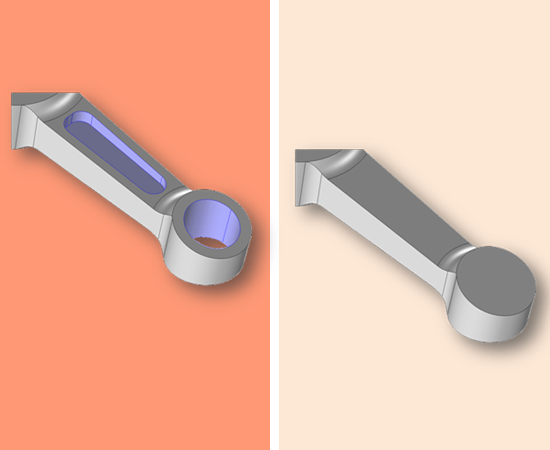 The Design Module contains tools to detect and repair your CAD models, where small anomalies, such as adjacent faces not intersecting at the same point, may exist. Anomalies can either be knitted together manually or automatically through setting tolerances as part of the import and repair process. If you prefer to repair the CAD model in your CAD tool, it may not be very easy to identify where the anomalies exist. You can use the Design Module to find them first. A repaired geometry can still contain geometric features that make it difficult to either mesh or perform robust simulations. In particular, small features may concentrate large numbers of mesh elements in regions where changes in the simulation results are negligible and can thus be ignored. The Design Module contains tools for identifying and defeaturing by removing certain features, such as spikes, holes, slivers, short edges, and small faces, for example. Like the repair operations, these features can be identified and removed in your CAD tool, or by the Design Module, manually or automatically. Other defeaturing tools allow you to identify difficult-to-mesh features, such as grooves, and to cap, patch, fill, or delete them. An example of re-parametrizing a geometry is when imported fillets are inconsistent for simulation. These fillets can be identified and defeatured, and then, using the fillet operation in the Design Module, new parametric fillets can be included. Virtual Geometry Operations are a useful tool within COMSOL Multiphysics that provides better meshing analysis solutions. This is done through instructing your meshing tool to ignore selected entities and features, thereby avoiding concentrating meshing in these regions – the meshing is taking place on a virtual geometry. The ignored regions would typically be part of the geometry where your simulation results are uniform or irrelevant to your particular situation. You can use Virtual Geometry Operations to ignore edges, vertices, and faces; subsequently form composite objects; or collapse the entities. These operations are included COMSOL Multiphysics and augment the geometry manipulation capabilities of the Design Module. Particularly, when certain features are difficult to remove through the Design repair and defeaturing tools. ACIS is a registered trademark of Spatial Corporation. Autodesk, AutoCAD, and Inventor are registered trademarks or trademarks of Autodesk, Inc., and/or its subsidiaries and/or affiliates in the USA and/or other countries. Parasolid and NX are trademarks or registered trademarks of Siemens Product Lifecycle Management Software Inc. or its subsidiaries in the United States and in other countries. PTC, Creo, and Parametric are trademarks or registered trademarks of PTC Inc. or its subsidiaries in the U.S. and in other countries. SOLIDWORKS is a registered trademark of Dassault Systèmes SolidWorks Corp. All trademarks listed herein are the property of their respective owners, and COMSOL AB and its subsidiaries and products are not affiliated with, endorsed by, sponsored by, or supported by those trademark owners. For a list of such trademark owners, see http://www.comsol.com/tm.